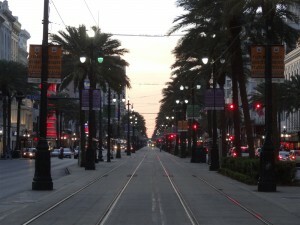 Time to finally write about one of my favourite cities in the US, if not in the whole world, New Orleans. I absolutely love the place and it is actually a shame that I had to wait for so many years to see it again. My first visit there was in 2001 when we stopped in the Crescent City during our transcontinental trip from Florida to California. We only had a few hours to explore this amazing place before heading further west. 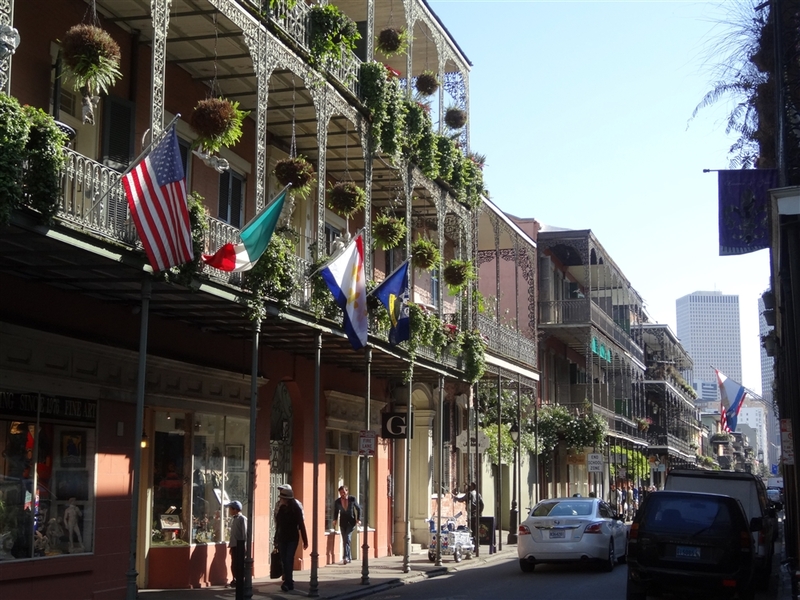 We did our best, walking constantly for hours through the streets of the French Quarter, and the city really made its impact. Still, it was only a few hours stop and we didn’t have a chance to try its famous (or, for some, infamous) night-life. So, finally, after all those years I decided to visit the city again and see if it is really as great as I remember it. It could be just that because it was one of the first such places I have ever visited I just have too good memories of it. Then of course was the hurricane Katrina in 2005. So, how is New Orleans now? 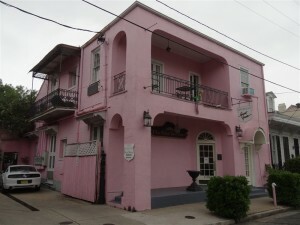 This time we decided to stay here for longer and booked ourself a cheap room in a guest house right on the edge of the Vieux Carré (as the French Quarter is also called), literally minutes from all the action of Bourbon Street. It was not particularly imaginatively named as “New Orleans Guest House” but it was historic building, painted pink, with a nice patio (where breakfast was served) and a resident cat. All the right boxes ticked then. After parking our Mustang and dropping bags into our room we hit the town immediately. 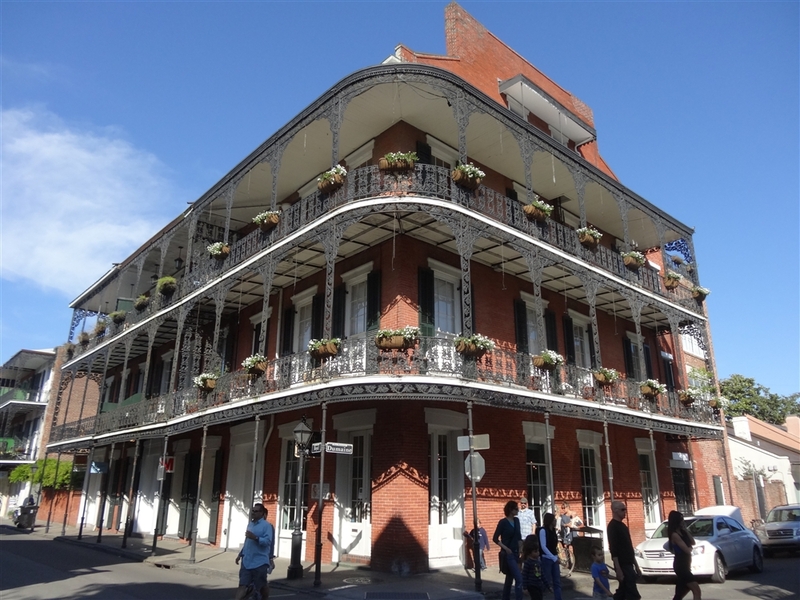 As I mentioned already, the hotel wasn’t in the French Quarter proper but it was still in a historic neighbourhood with narrows streets, old houses (some quite tired looking but still charming) however also surprisingly quiet and non touristy. It really felt local and low key, precisely like I have alays imagined residential parts of the old New Orleans. After a further few minutes walk we found ourselves in the heart of the action, right on Jackson Square in the centre of the French Quarter. Which isn’t really French at all. Most of the buildings and all the feel and atmosphere people associate with the French heritage is actually Spanish. I mean New Orleans was of course established in 1718 by the French (specifically by certain Jean-Baptiste Le Moyne de Bienville) but it was ceded to Spain in 1763. Then in 1788 The Great New Orleans Fire and another great fire in 1794 destroyed most of the Quarter’s old French colonial architecture, leaving the colony’s new Spanish overlords to rebuild it according to more modern tastes. So all the colourful walls and tiled roofs as well as the elaborately decorated ironwork balconies and galleries are examples of Spanish rather than French heritage. Which of course doesn’t really matter. What matters is the fact that is is one of the best preserved colonial districts in Americas as well as damn fun place to spend some time. Now, there are some parts of Vieux Carré which feel rather too commercial. Area around the Jackson Square as well as part of Bourbon Street closest to the Canal Street are the best examples. They are dominated by shops selling or sorts of tacky stuff as well as bars with very little atmosphere. It can also get quite rowdy around that part of town after dark. 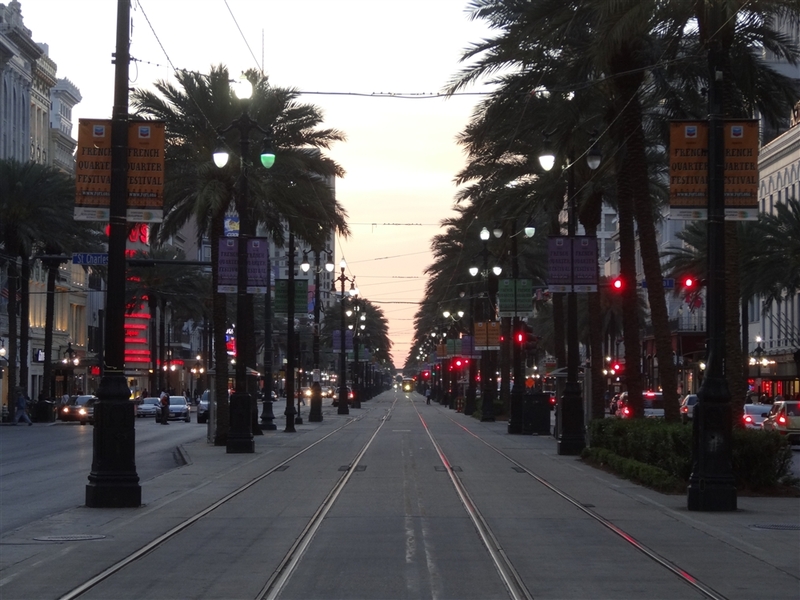 However, New Orleans is not all about the French Quarter. It might be the touristy heart of town but the Central Business District is located immediately west of it, right across the grand Canal Street which is a wide, palm-lined, boulevard with vintage trams running along its median. This part of town was developed in the wake of the Louisiana Purchase of 1803, as people from other parts of the United States flocked to the city. Consequently, the district began to be referred to as the American Sector and its architecture resembles other American cities. It is nice but not particularly unique. While we were wandering around there we stumbled across a free afternoon concert organized on the Lafayette Square (the second oldest park in New Orleans) which was simply called Wednesday on the Square and was co-organized by the New Orleans Saints football team. Music was good, beer was cheap and people were friendly, what else one might need? Still it is only after dark when the Big Easy shows its best side, especially in the French Quarter where we went back after the concert. Neons illuminate and advertise the whole galaxy of watering holes in various shapes and sizes. One of them is Lafitte’s Blacksmith Shop which built sometime before 1772 is one of the older surviving structures in New Orleans. It also claims to be the oldest continually occupied bar in the United States. True or not it was quite a fun place. Very dark, with two super efficient and professional, but also positively grumpy, barmen who complained about the fact how the tour groups complain about their bad service. Here I’m all with them. How can two guys serve 40 bloody pensioners from a coach tour coming all at the same time? Besides, it is a bar not a museum, take you damn tour group somewhere else. 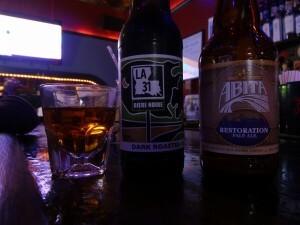 As much as the French Quarter bars are fun we wanted to try something less touristy and more local. For that we went back in the direction of our hotel. Very quickly things got calmer and bars got much more laid back than in the main tourist zone. 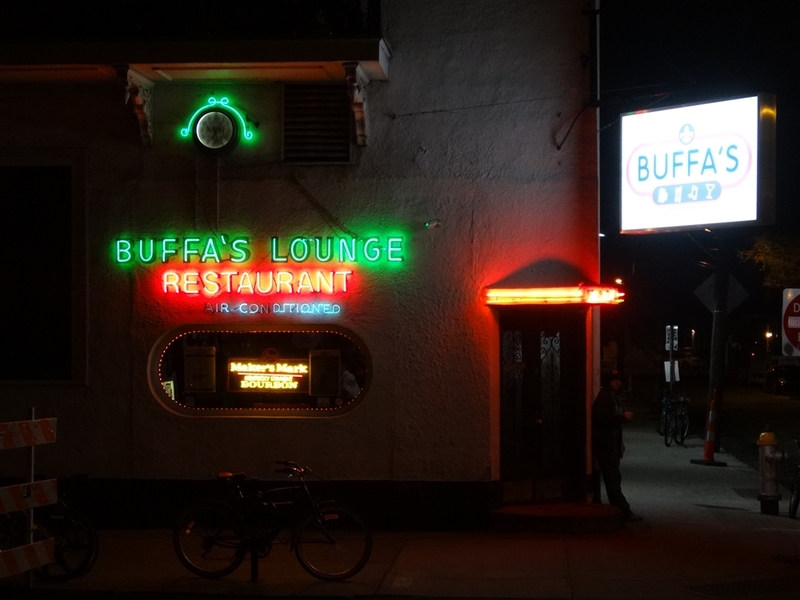 Here, on the corner of the Esplanade Avenue (which is technically a boundary between the French Quarter and the Faubourg Marigny neighbourhood) and Burgundy Street we found Buffa’s Lounge. It was a real gem with friendly staff serving cheap bourbon and beer. And if you like drinking spirits you’re gonna love New Orleans. Nobody bothers with precise measuring of your drink with some official measuring tools (like you see in the UK), they just pour a generous portion straight from the bottle. And I mean really generous. The usual shot in Buffa’s was at least twice the size of the double shot in London. I’m not kidding you. All in all we had lots of fun and spent more time in the bar than we were planning. In fact there is still an ongoing debate how long did we actually stay and how did we got back to our hotel. There are some vague recollections of wandering underneath the freeway (which wasn’t really on the way to our hotel) but not much else is known for sure. The following day we went back to the French Quarter for yet more wanderings. To escape brief rain we got inside Louisiana State Museum located in historic building right on Jackson Square. 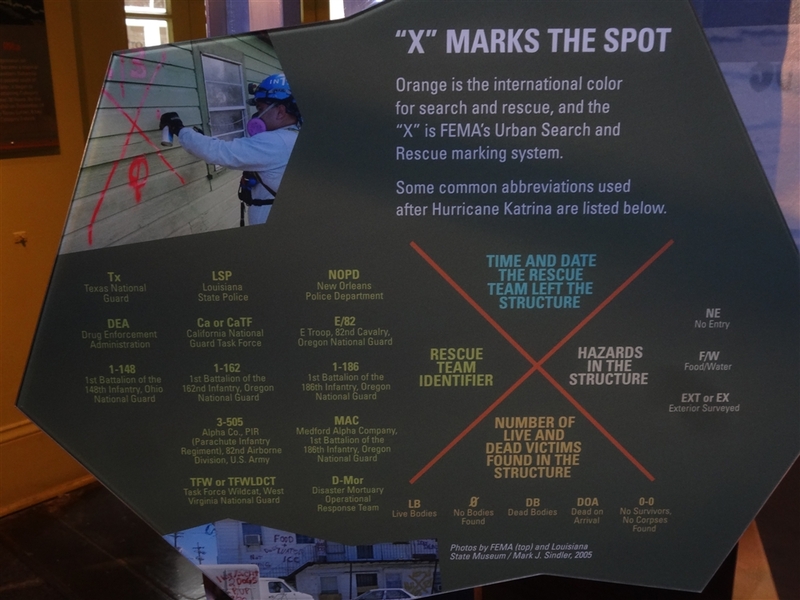 Its most interesting exhibition is called Living with Hurricanes: Katrina and Beyond is well worth visiting. 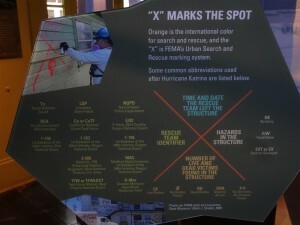 It explains in detail the dreadful events of August 2005 when Katrina hit the city. Its authors clearly tried to straighten some myths and misconceptions which many people carry after watching those events on TV, often thousands of miles away. I found the exhibition very interesting but there are signs of curators trying over glorify the local response a bit to counter the bad press the city got back then. After touring the French Quarter and the CBD for a few hours we decided to drive to yet another interesting part of town, the Garden District. 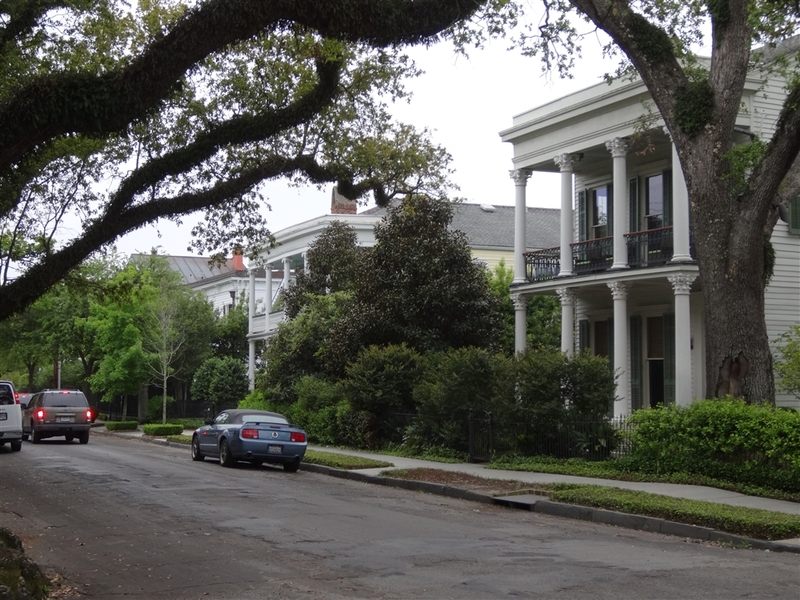 Located upriver from both the French Quarter and the downtown it is a residential neighbourhood dominated by large historic houses built mostly between 1832 and 1900. This whole area was once a number of plantations, including the Livaudais Plantation. 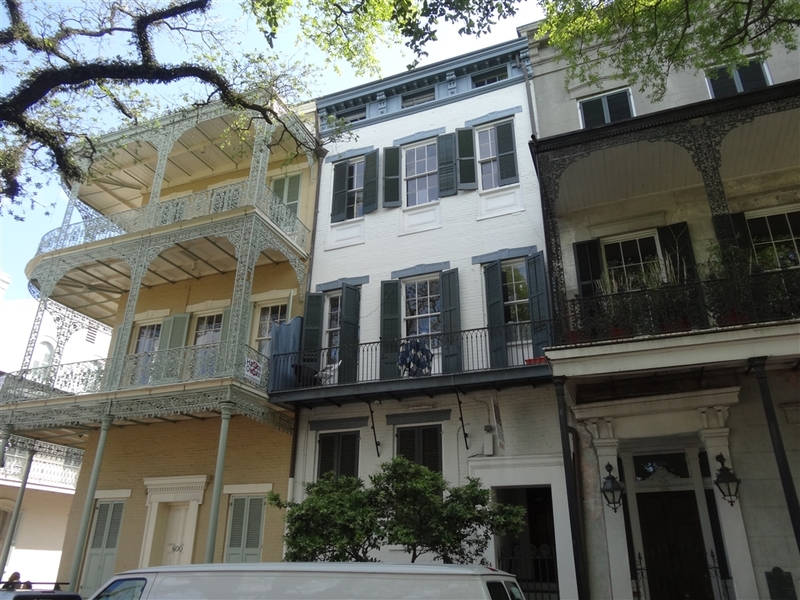 It was sold off in parcels to mainly wealthy Americans who did not want to live in the French Quarter with the Creoles. 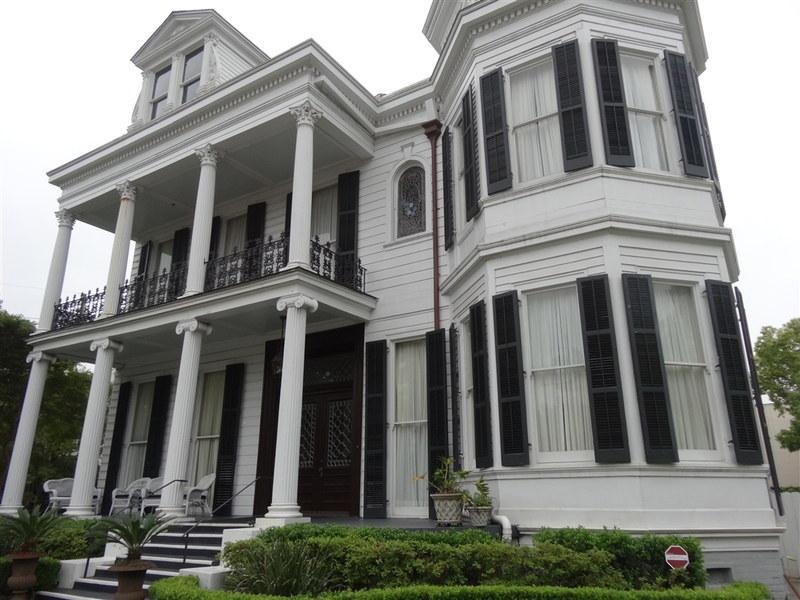 It became a part of the city of Lafayette in 1833, and was annexed by New Orleans in 1852. The district was laid out by New Orleans architect, planner and surveyor Barthelemy Lafon and you could actually call it an archetypal suburb. We walked around the neighbourhood in random pattern admiring beautiful “gingerbread” decorated late Victorian houses and lush subtropical gardens which surrounds them. 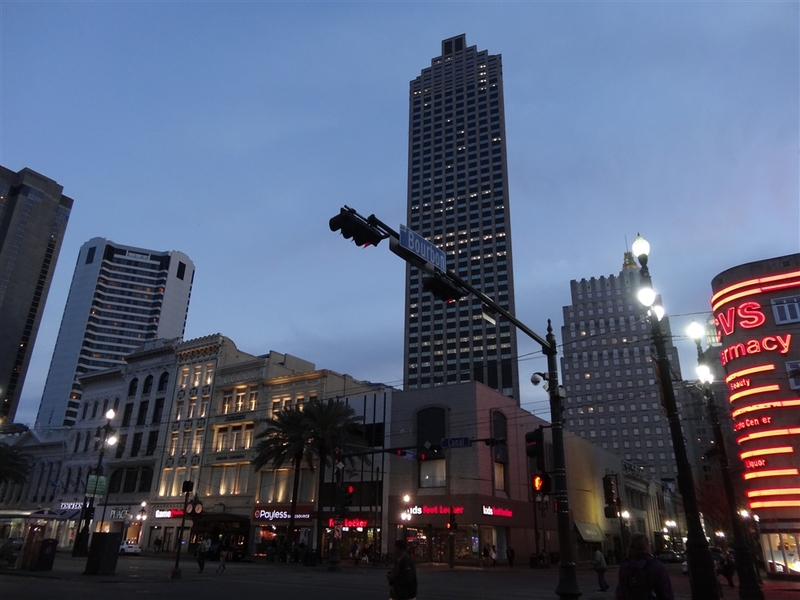 It felt like fantastic (but also exclusive and expensive) place to live, very different from the poor parts of the city which dominate the public image of New Orleans in media. Before heading out of the Garden District we popped in to a local restaurant and treated ourselves to a delicious waffle which was served with so many tasty toppings that I would have to write a separate blog entry just trying to explain it. That was the last point on our visit to the Big Easy as we had to start heading back towards Texas where our trip was about to end in a few days. I have to admit that normally after a few hours in any city in America I’m eager to hit the open road again. This time was different as I felt that even after two days I could still stay longer. I think New Orleans definitely became my favourite city in America. Imagine that someone offers you a trip to any city in the US under the condition that you will have to stay in that one place for at least a week and don’t go anywhere else. For me it wouldn’t be Chicago or Boston, not even San Francisco or NYC and definitely not the overrated Austin. Only New Orleans. It is a place where one can calm down, chill out and simply enjoy simple life visiting different local bar every night (and day) to listen to good music and savour tasty food and cocktails. Enjoy! This entry was posted in Uncategorized and tagged Buffa's Lounge, Faubourg Marigny, French Quarter, Garden District, Lafayette Square, Lafitte's Blacksmith Shop, New Orleans, Vieux Carré on November 9, 2014 by admin.